Sarah Scarnechia and Win Vision capture the $5,000 High Junior/Amateur-Owner Gambler's Choice, sponsored by Wisconsin Equine. 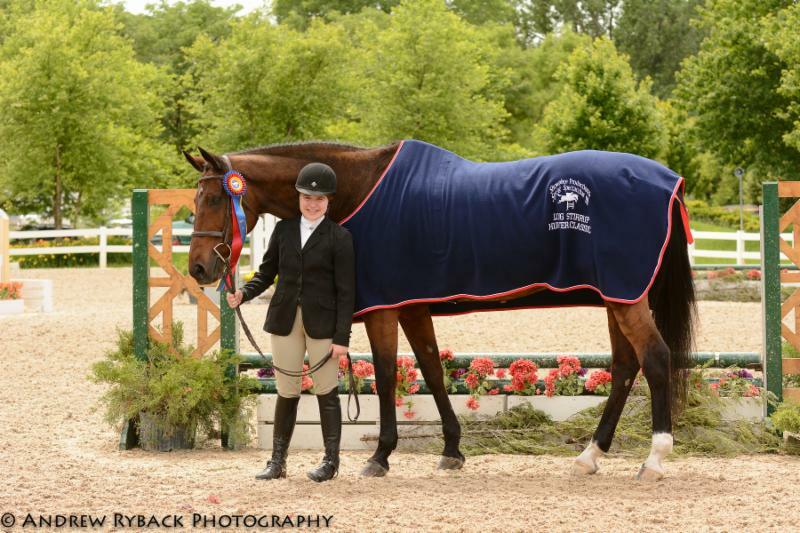 Wayne, IL - June 19, 2015 - Despite just moving up from the Low Junior/Amateur-Owner Jumpers, Sarah Scarnechia and Win Vision have only found success. Showing in only her second High Junior/Amateur-Owner Jumper class of her career, she took a gamble in the Grand Prix Ring during the Showplace Productions Spring Spectacular III. As all bettors know, without risk there is no reward, but Scarnechia took it up a notch in the $5,000 High Junior/Amateur-Owner Gambler's Choice, sponsored by Wisconsin Equine, to clear Anderson Lima's track and win the class. She clinched the victory with 1,260 points, with one fence making the difference for the 19-year-old. It was actually family-friend and Showplace Productions Spring Spectacular Show Manager, Pat Boyle, who hinted that one turn might make the difference, and it did. "My trainer Nathaniel [Estes] and I figured out a course, but while we were watching the Lows, Pat suggested that I do a different turn that would add an extra jump. It's ironic, because his daughter Caitlin was my plan giver last year, and we won the Low Junior/Amateur-Owner Gambler's Choice with her track," Scarnechia laughed. "That turn was what actually gave me the winning jump." Coincidentally, the jump was the LUXMAX USA oxer, the very same one that Scarnechia soared over the previous year to clinch the win, and it is the jump that is sponsored by her father's company, LUXMAX USA and Win Vision. Scarnechia knew that all she had to do was leave up the 200-point joker to take home the victory, and when she landed from the obstacle without fault, she was nothing but smiles. "It felt awesome! I was just expecting to get around the course, and to go clear since this was only my second High class," Scarnechia elaborated. "To win, it feels great! I have been riding Win Vision for almost two years, and we have moved up really quickly. To see how far we have come together is so special. It is always nice to have a win, but to do it two years in a row and at a show that feels like home, makes it even more wonderful-apparently this is his class." Chelsea Babcock and Arona completed a similar track, but fell shy by 20 points to take the second place finish. Caelinn Leahy and Esquilino Bay tied with Babcock in points, but their time of 71.624 seconds would rank them third in the standings. Scarnechia became involved in the sport of show jumping just four years ago, when her family moved back to Illinois after spending 12 years in California. She rides with Nathaniel Estes and Candice King, moving quickly through the ranks in the pursuit of a career in the grand prix ring, and hopes to one day compete internationally. In the $5,000 Low Junior/Amateur-Owner Gambler's Choice, sponsored by Adequan, Molly Struve reined in another win with Orchidee MiLody. Struve has dominated the Low Junior/Amateur-Owner Jumper division, even riding to the win during the Accumulator class during the second week of the Spring Spectacular Series. Today, she sealed her first place finish with a score of 1,390 points. Second place went to Giavanna Rinaldi and Clever Girl with 1,350 points, while third was awarded to Brooke Saltzman and Nicholas for their cumulative score of 1,320 points. "I watched Gia go, and she had a great ride with 1350 points, so I knew I would have to go fast to get all of the jumps in our plan," Struve described. "I knew that if I didn't go fast, I wouldn't beat her score. Orchidee MiLody gallops really well, so that is her forte. We picked the outside of the ring, turned around and then galloped all the way back. We wanted to play to her strengths, and it worked." Struve concluded, "I think these classes are great, they help to mix up the usual classes and make it fun. I enjoy the challenge of coming up with a strategy and a plan that works best for my horse. I think it is nice that you can design a course for your horse that can let your horse shine." Friday marked a big win for Lisa Goldman and Hindsight, a young horse that was competing in the 2'6" Novice Adult Hunters before Goldman kicked off his jumper career. During the $5,000 1.30m Open Jumper, sponsored by Marshall & Sterling, Goldman claimed the victory with an efficient and clear jump-off time of 33.046 seconds. "He is one that I am really excited about," Goldman said. "He was so good out there, and I am so happy with him. He is learning how to go fast, and he really likes his job. I was able to leave out a stride in the jump-off and do five across the angle and I think that is where I caught them. He has a really big step. I made up a lot of time in the beginning because he locked onto the jumps from so far back. What a way to end the three weeks, he gets to go back home now." Dorothy Douglas and Safira SZ took the second place finish, behind Goldman, in 33.876 seconds, while Trapp O'Neal and Quilona Z were awarded the third place finish in 34.834 seconds. Navigating Lima's track proved harder than expected for the field of competitors facing off in the $2,500 1.40m Open Jumpers, sponsored by CWD. Out of the six slated to go, it was 16-year-old Louisa Brackett who would ride to the top as the only clear of the class. She rode Memphis Belle to a clear first round as the first rider on course, and continued into the jump-off where she cleared the short track in 31.041 seconds. As it would turn out, no other competitor would clear the track in the consecutive rounds. Amelia McArdle and Seniorita de la Roc took the second place as the fastest of the four-fault efforts, while third place was awarded to Natalie Hansen and Zeldenrust Z for their four-fault round completed in 74.309 seconds. "It was so much fun," Brackett smiled. "My trainers, Mary and Lisa Goldman, moved me up without telling me that I was going to do it this week, so it was really neat. It was a big step for me to move up, and to feel confident." Brackett continued, "I couldn't believe that I was the only one to go clear. We have been making moves since the Winter Equestrian Festival, gradually going into the bigger heights. We moved up from the Low Junior Jumpers to the Mediums, and we were champion during week 8 of WEF. It was really neat to have that experience on such a large scale. Since this has been going quite well, it is my hope to continue on this path." With college on the horizon, Brackett has begun exploring her different options, recently returning from a four-day experience riding at Texas A&M. She was able to experience collegiate riding, and the one-on-one interaction of a collegiate equestrian program. "Memphis Belle is my soul mate, she wants to do just as well as I do," Brackett said. "She is the sweetest horse, and she is a true people horse, which has really strengthened our bond. It's amazing to see how far we both have come. Belle has taken me from the Low Children's Jumpers, and it is neat to have a horse that doesn't say no. She had the heart, and I trust her no matter what." Hailey Royce returned to the Lamplight Equestrian Center for the second year, once again setting the tone in the $1,500 WIHS Children's Classic, sponsored by The Vogel Family. They took the win with a narrow lead of only 1/100th of a second to set the time at 24.256 seconds for the victory. Royce has had the chestnut for a year and a half, and the 10-year-old rider has seen a lot of success with her trusty mount. Royce has been riding with Lance Williams, out of Gurnee, IL, for almost two years. 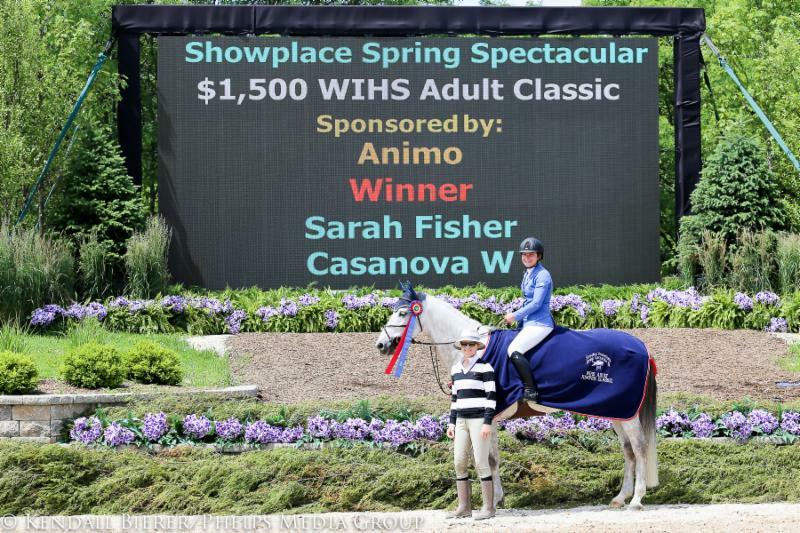 Sarah Fisher and Casanova W beat out a field of 35 contenders during the $1,500 WIHS Adult Classic, sponsored by Animo, on Friday morning. Fisher rode Casanova W to a clean jump-off effort in 26.744 seconds to seal her rank at the top. She took the lead over initial pathfinder, Emily Colella and Washington, who finished in the second place. Peyton Purcell and Hallowberry Knight rounded out the top three with the jump-off time of 27.543 seconds. The Showplace Productions Spring Spectacular III continues tomorrow with the $50,000 Wells Fargo Advisors Grand Prix, the highlight event of the series, which is set to take place Saturday at 3 p.m.
Wayne, IL - June 19, 2015 - Now halfway through its ultimate week of the series, the Showplace Spring Spectacular III welcomed Junior riders to take center stage in the hunter ring, and stakes are high as the three-week series is winding down. With only the first portions of the divisions having run today, horses and riders will reappear tomorrow to hopefully claim their respective championship titles, and while some will have to overcome the odds, a select few have gained the upper hand headed into the second half of their respective divisions. First on the Junior card was the Large Junior 16-17 Hunters, attracting nine entries into the well-decorated Wisconsin Equine Arena. The first three classes of the division consisted of a hunter course, a handy phase, and the under saddle, and all nine competitors proved to be in it to win as the placings were consistently swapped in each class. Emma Lena Green and her mount Hennessy, which she owns, produced the best overall performance with the first, third and fourth place finishes. Hennessy, known in the barn as "Chippy," was initially bought by Green as an equitation horse, but the gelding has also proven himself as a capable hunter. Bought while at the Showplace Spring Spectacular last year, the pair has come a long way in only one year, qualifying for the 2015 ASPCA Maclay Regionals and the Pessoa Medal, and are aiming to add Junior Hunter Finals to that list, as well. "He's a great handy horse. We had a nice first jump using an inside turn, followed by a quick downward transition to the trot jump," Green noted of her horse and their round. Hoping to gain some experience and put mileage on the horse before the equitation finals in the fall, Green and Chippy have a busy schedule ahead of them. 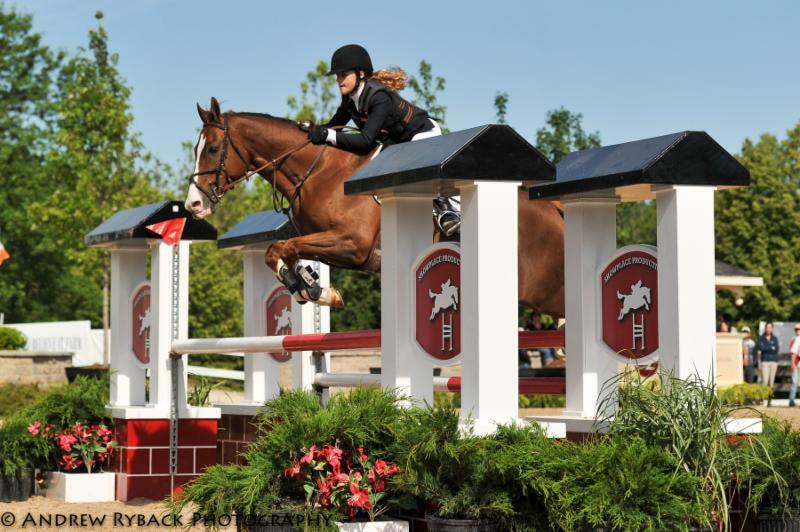 Following Showplace, they will likely venture to the Junior Hunter Finals at the Brandywine Valley Summer Series in Devon, Pennsylvania, followed by the Great Lakes Equestrian Festival in Traverse City, Michigan. Kentucky will follow, with the Maclay Regionals rounding out the planned show season in St. Louis. Owner-rider Claire McKean and On Board also showcased themselves well headed into the second day of the divisional competition tomorrow. Earning the first, third and fifth, the pair is only one point behind Green and Hennessy in the current standings. Shannon Klein and her own Capable rounded out the top three in the ranks after two consecutive second place finishes in the over fences portion. The younger riders took their turn to shine next in the Large Junior 15 & Under Hunters. Two top contenders will enter the final classes of the division with a slight advantage above the rest tomorrow. Giavanna Rinaldi and Alex Jayne's All Wrapped Up claimed two top finishes, while Paige Matthies with the ride aboard her own mare Roc Paper Scissors navigated her way to the second, third, and fourth. Roc Paper Scissors, out of the famous Roc USA sire, has proven to be a successful Junior Hunter and Performance Working horse, helping Matthies to qualify for a number of national finals over their career together. "She does particularly well over the jumps, and is great at tighter turns which helps us in the handy," the rider praised, adding "we will be headed to Harrisburg and Kentucky for finals later this year." Two returners, who swapped their large mounts for smaller ones this time around, came back to the ring to face off against eight other horse and rider pairs in the Small Junior Hunters. Instead of splitting the division into age sections, the two groups were combined to accommodate for a more competitive class. Proving that their prior performances were not left to luck, Emma Lena Green and Giavanna Rinaldi once again demonstrated their prowess in the hunter ring by snagging the majority of the top placings in the day's three classes. Viva Las Vegas, a dark bay gelding ridden by Green, earned the utmost points due to the duo's first and double third place finishes. Coincidentally, Green also purchased this horse at a Showplace event, with the transaction taking place two years ago during the Showplace Spring Spectacular Series. "Vegas is just recently returning to the show ring after a hiatus, so we are still getting back into the swing of it," Green commented. Rinaldi, this time with two mounts, rode Galway Farm's Divine to the second and the fourth place positions while Spencer Ranch's La Noche, her other ride, earned the fourth and second in the handy and hack, respectively. Ciara Murphy rode her own Right On to a strong start, finishing in first and third on the judges' cards in the over fences and handy. In the Junior 3'3" Hunters, Sloan Hopson and Abercrombie, her own horse, made a statement by nearly topping the leaderboard in all three of their classes. With a first in both the handy round and the hack, the pair barely fell short with a third position finish in the fences round. Jessica Brady and her mount Memphis look to be giving the pair a run for their money, placing second and third, still in the pursuit for tomorrow's crown. A number of Classics took place across the showgrounds, with the Long Stirrup Hunter Classic, sponsored by the Pennington Family, taking precedence in Ring VI. Throughout the day, the Stephens Family and Rendezvous Farm graciously sponsored the Long Stirrup Hunter and Equitation divisions, and a number of those young exhibitors also tried their hand in the day's Classic. The ultimate victors, Belle Austin and Anna Prall's Prince Valiant led the victory gallop, followed by Peacock Ridge LLC's Dreamworks with Elise Stephens aboard. Two $500 Classics for the Childrens division enticed a lofty 22 entries in each class, with the WIHS Children's Hunter Classic won by a three-time champion this week. 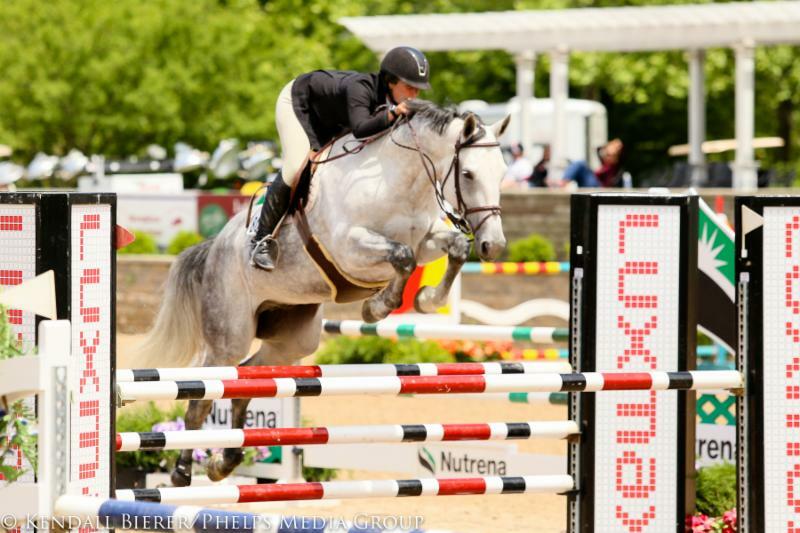 Natalie Alden and her own King of Hearts claimed their third win of the week, with the first two at the hands of rider Caitlyn Shiels in Tuesday's USHJA National Hunter Derby and Wednesday's $1,000 USHJA Pre-Green Incentive Stake. This time, the horse's owner had the ride, and she came out victorious. Following behind Alden and King was owner-rider Alex McNally and For Adventure in the second position. Third was earned by Elizabeth Woods and KNW Farms LLC's Peroni. Woods and Peroni made another appearance in the next Classic on the agenda, the Marshall & Sterling Children's Hunter Classic. The pair improved upon their standings from the prior class, advancing to the second spot, just behind My BFF, ridden and owned by Erin Cummins. Not to be left out, the adults had a designated prize money class allotted for them also. The $1,000 Novice Adult Hunter Classic, down the hill in Ring VI, brought 10 riders hungry for the main stake of the pot. Lisa Kelly had the ride on her personal horse, Quality Counts, and rode to the rosette. Taking the impressive second and third with two mounts in the class, Anne Waldo bested the rest of the field with her own Roc All Night and Laura Zingg's Lanshark. The Equitation and Hunters, as well as a number of classics, continue tomorrow as the Showplace Spring Spectacular Series reaches its fourth day of competition. The highlight of the day will be the $50,000 Wells Fargo Advisors Grand Prix. For more information on Showplace Productions or the Spring Spectacular Series, please visit www.showplaceproductions.com.